George Curry tries to set up a time to come speak to the students at Berry. He thanks her for the invitation but expresses his hesitation in his ability to perform a speech satisfactory to their expectations. He however does make an effort to set up a time. 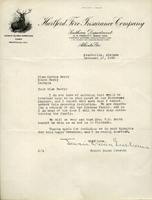 Martha Berry talks about Mr. Culpepper's association with the south and the school. 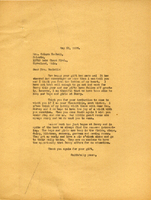 Martha Berry expresses her wish for Mrs. Culpepper to visit Berry so she can meet the boys and girls and thus experience The real Berry. 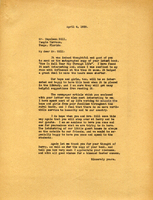 A letter from Martha Berry thanking Mrs. Hope for her letter regarding Miss Gerard. She goes on to state how glad she is that Mrs. Hope is so near to Berry. She invites Mrs. Hope to join the Pilgrim's there for a visit next Tuesday, April 19th. 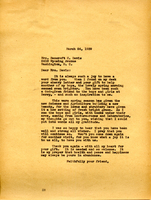 A letter to Mr. Hodges from Martha Berry hoping that he will come for a visit soon and see the campus in the beauty of full spring and bring friends along for a nice visit. A letter of thanks to Mr. Hill for sending an autographed copy of his latest book, "How to See Your Way Through Life." Martha Berry mentions the newspaper article he enclosed in his letter and how she feels about the information found there. She invites him and Mrs. Hill for a visit soon to Berry for them to stay a one of the little guest houses. 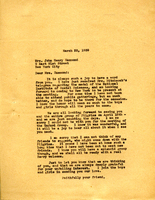 A letter informing Mrs. Hammond of Miss Berry's intent of making a trip to New York for the medal of the National Institute of Social Sciences meeting. She then goes on to describe her excitement in seeing Mrs. Hammond and her entire group of Pilgrims on April 18th. She apologizes for not being able to suggest friends who might make the journey with Mrs. Hammond and the pilgrims. She concludes by sending her love along with the boys and girls. 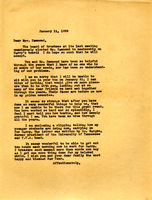 A letter informing Mrs. Hammond of Mr. Hammond's unanimous election to for a membership on Berry's board. She goes on to say her regret in not being able to attend a special event for Mr. Hammond, and how after everything she should be there and wishes desperately that she could. 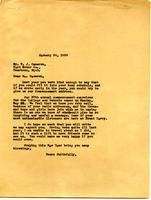 Berry enclosed a letter clipping written by Dr. Morgan, former President of UT telling of the successes of the younger Berry students. 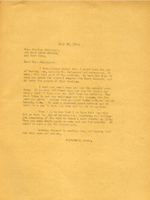 A letter asking about Mr. Cameron's initial interest in coming to give a Commencement address. The 37th annual commencement exercises for the College and Schools comes on Monday, May 23. She hopes that he will come at that time to participate. Thanks to Mrs. Davis from Martha Berry for her donation to the school, and she goes on to talk of the improvements of Berry as well as the new Science and Agriculture building. She then invites Mrs. Davis down for another visit. 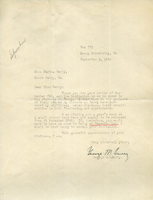 General Moseley describes to Martha Berry his deep pleasure in visiting Berry schools, and says that it was the highlight of his visit to Rome. He goes on to say that he will always remember the service in the Chapel, which he says was not impressive so much by the beautiful chapel, but by the manner of the boys and girls of the audience. 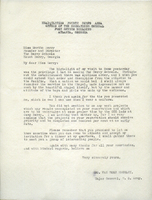 He hopes to look up information about the projects being undertaken by the CCC at Berry and his determination to promote their completion. He finishes by inviting her to dinner next time she is in Atlanta. 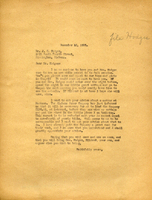 J. Hodges writes to Martha Berry in return to her invitation for him to come give a speech to the boys and girls at Berry. He hopes that he can come and visit, even though he is hesitant to perform a speech because of his lack of experience. He also talks about seeing the cottage on the mountain that Martha Berry is building. Lastly, he says that he friends at the Power Company that can help her with an issue she is having with them. 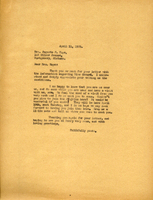 In this letter, Martha Berry asks for Mr. and Mrs. Hodge to come and visit the school. She hopes they will come to see the campus in full operation. She also asks for advice about a matter of business. The Alabama Power Company requires her to lend them 156.00 dollars for interest, but she believes this request to be unreasonable. A letter of thanks to Mrs Haskell for her gift to Berry, and how much it means at that financially difficult time. She thanks them for the invitation to come visit next winter, and extends an invitation to Berry for the next time they are in the south as well. She concludes with an update of the progress of hard work going on there at Berry. 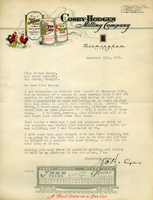 A letter informing Martha Berry that Miss Gresham can't go to the Christmas pageant because she's having a family reunion and needs to entertain everyone. An invitation for the 29th of October to an unspecified event at the Mountain Brook Country Club.